Los Cocos is the meeting place for tourist which arrives at Chetumal. It is situated in the most privileged location, on the main avenue of the city. 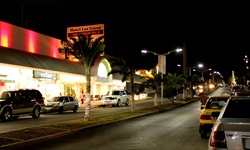 Its architectural design and lighting stand out in the heart of the commercial and tourist area around it. Located opposite the center of Cultural de las Bellas Artes, just 100 meters from the Museum of Mayan Culture and just blocks from the city's main park, the Government Palace and the Boulevard coastal shores of the Bay of Chetumal. The airport, the seaport and the bus terminal are also located near the hotel, just a five minute drive. Around the hotel, in the historic center, you can also see some public buildings. In addition to all the services that tourists need to enjoy their stay in Chetumal as well as other sights of Quintana Roo such as the extraordinarily beautiful Bacalar, Mahahual and the Costa Maya, Playa del Carmen the Riviera Maya, Cancun, Isla Mujeres and Cozumel, and the legendary Mayan ruins of Kohunlich, Calakmul, Tulum and Chichen Itza. The beautiful Caribbean islands of San Pedro Ambergris Caye Caulker and Caye in the country of Belize are nearby.